I went up to my parents’ house for a birthday BBQ yesterday (which was super delicious) and came home with one of the sewing machines that’s been living in their basement – yay! It’s a Singer from the 1970s – model is Stylist 514. I downloaded the manual from the Singer website and threaded it up, but only managed to practice sewing together a few scraps before I heard a thunk! The feed dogs weren’t moving, and I couldn’t figure it out from looking just under the needle plate. So this morning, fully rested with lots of light, I opened it up. It’s not in bad shape, having been sitting unused since its last servicing. But those broken bits at the bottom? The plastic gear that makes the feed dog assembly go is just completely cracked and busted. 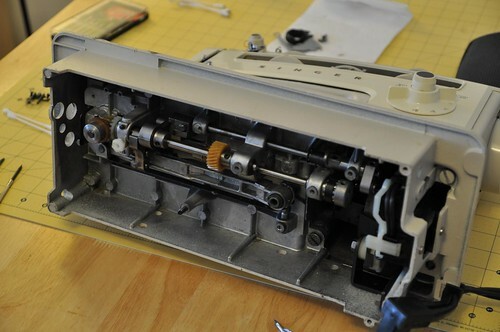 I did feel pretty accomplished after opening it up, seeing how it works, and putting it back together, so I’ve ordered the parts and I’m going to try fixing it myself. In the meantime, though, it’s back to needle and thread! 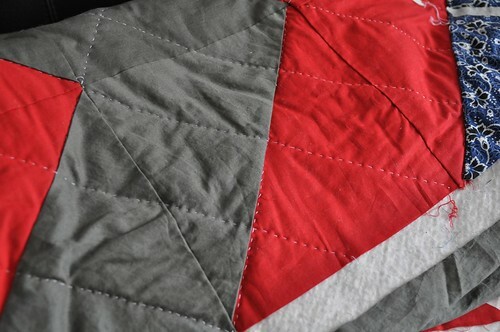 The quilting on the chevron quilt is coming along – I think I’ll be done after one more set of diagonals. I’m already planning my next quilt, which will hopefully be pieced on the sewing machine once it’s all fixed up. 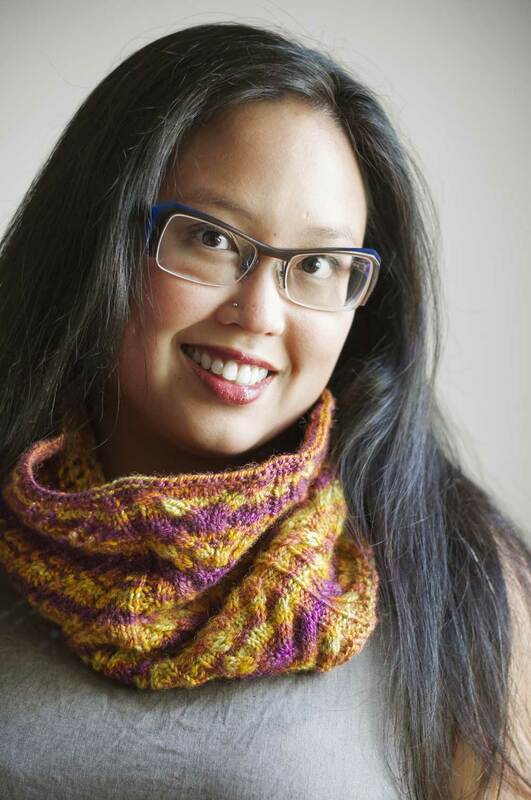 Oh, and a reminder – my birthday pattern sale is still on! Purchase any of my self-published patterns on Ravelry and get 29% off (no coupon code needed) until the end of Monday, August 5, 2013. Enjoy! I enjoy reading about your many crafty projects, and would really like if you could share more about how you quilt. My mother loves piecing quilts, but has always been intimidated by the actual quilting- maybe you could pass along some tips! 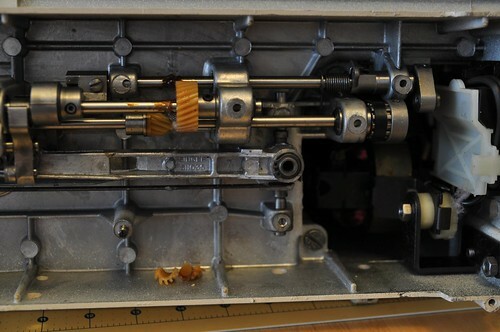 Depending on what you have to take apart to replace the gear, you might still need to take it to a repair shop to get the timing realigned. Just like a car, there is timing adjustments that need to be made from time to time. Hello, I’m hoping you can help me! 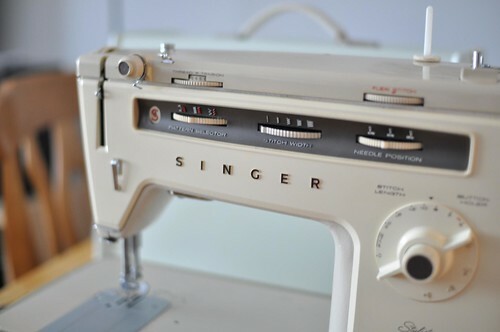 I have my Mums old Singer 514 machine and am having trouble finding instructions/videos on how to thread the machine.. I noticed you have the same machine…can you assist at all? ?